Among the many castle towns in Japan, Kanazawa is noted for not just retaining much of the physical structure of its heyday in the feudal period, but a substantial amount of traditional culture. 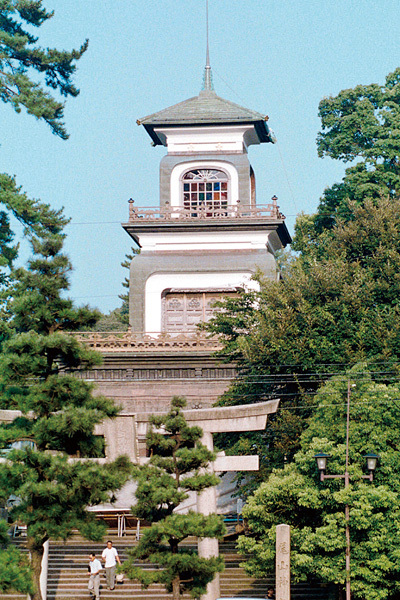 The fusion of the traditional culture of the castle town with the historical townscapes allows us to experience the unique atmosphere of a feudal Japanese castle town even today. The centre of the castle town was the home of the Maedas, Kanazawa Castle. The castle stands on the site of Kanazawa Hall, but it was greatly enlarged and rebuilt by the Maedas to attain its present form. The castle site, some 30 hectares in size, was protected by moats, and from the central bailey (hon-maru) 60 metres above sea level in the south, a series of baileys was constructed towards the north. Inside the castle the Maedas built their palace, guest suites, gardens, housing for their family and for powerful retainers, horse exercise areas, meeting rooms, and administration offices. The moats were faced with a variety of stone walls, which were in turn topped with longhouses (nagaya) and towers for defence, with earthen ramparts protecting the outer areas of the castle. Castle gates were given special attention, protected by square courtyards and earthworks. Most of these buildings and walls, as well as the moats, were pulled down or destroyed by the Meiji government after 1871. The only ones that remain are the Ishikawa Gate, the Sajikken Longhouse (Nagaya), the Tsurumaru Warehouse, and Ozaki Shrine (all registered as Important Cultural Properties). However most of the stone walls remain, and since they were built over a number of different periods they have explained a great deal about the development of style and techniques over that time. Kenrokuen Garden, one of the most famous gardens in Japan and designed an official Special Place of Scenic Beauty by the government, began as the private garden of the daimyo, east of the castle. Its oldest parts, the small lake and the sukiya-style teahouse beside it, date back to 1676, but the park was greatly expanded in the first half of the 19th century to its current form, a sublime blend of spaciousness and seclusion, panoramic views and water features. The 13th Lord Maeda, Nariyasu, also built a villa for his mother here, the Seisonkaku (Important Cultural Property). This villa still remains, with its garden, and with its fine interior detailing and bold use of colour allows visitors to imagine the palaces built for the ladies of the court inside the castle. Surrounding the castle were homes for some 2,000 families of samurai rank, and foot soldiers and other low-ranking vassals, along with commoners. All residents were assigned areas to live based on their status. The most important vassals were granted large estates near the castle, but the lowest ranks of samurai were given small houses out by the edges of town, where many of the temples were. The roads followed the topography, with few grids, and many ending at moats, running diagonally, or dead-ending, creating an extremely complex layout. This maze-like urban space still remains, some four centuries after the castle town was laid out, showing the history of the city. About 60% of the roughly 700ha of the castle town was occupied by the homes of the samurai. 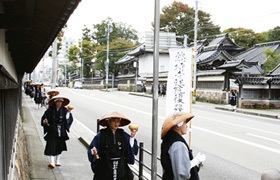 Much of this land is now taken up with government offices, shopping areas, and housing, but most of the roads are still the same as they were centuries ago, and samurai areas remain as tourist spots, called “buke-yashiki,” and can be visited. 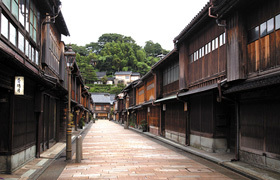 Kazuemachi and the Eastern Tea District (Eastern Teahouse District) are full of traditional townhouse architecture, where we can still imagine the streetscapes of the commoners under the Shogunate. The townsmen culture of the tea ceremony, dancing, music, and cooking is still passed on in these areas. 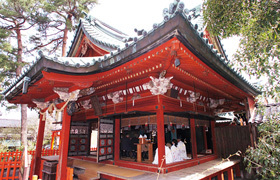 In the three major temple districts on the outskirts of the town, Teramachi, Utatsuyama, and Kodatsuno, there still exist some 30 to 50 temples clustered together. These temple districts were the focus of faith for the castle town residents, and at the same time, with their high walls and large compounds, were deliberately located here to form a primary defensive perimeter around the castle town.